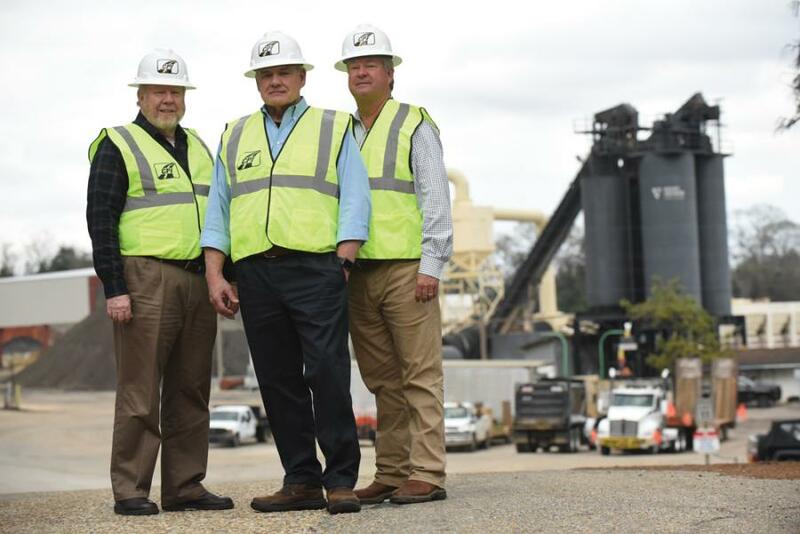 (L-R): Construction Partners’ leadership team, CFO Alan Palmer, CEO Charles Owens and Senior VP John Harper, who also is president of Wiregrass Construction. The road to success for Construction Partners Inc. (CPI) is paved with strong leadership, a continued strategic growth plan in the Southeast and the ability to attract talented individuals. CPI is one of the fastest-growing civil infrastructure companies in the United States, specializing in the construction and maintenance of roads in Alabama, Georgia, Florida, South Carolina and North Carolina. With corporate offices in Dothan, CPI was founded in 2001 and currently has about 2,000 employees, which is double the number employed by the company eight years ago. Charles Owens, chief executive officer; Alan Palmer, chief financial officer; and Ned Fleming, executive chairman of the board and managing partner of SunTx Capital Partners, a Dallas-based private equity firm — all of whom are Wiregrass natives or have strong connections to the area — are CPI founding partners. In his role at SunTx, Fleming brought in the private equity partners who provided the initial capital to start CPI. All three men are still active in the business today. "We are happy to have our corporate offices in Alabama and Dothan," said Owens. "There is a lot of excellent talent in Alabama and the Wiregrass area." In May 2018, CPI took another milestone step in its relatively short history when it became a publicly traded company. It is one of only a few public companies that specialize in road construction. CPI raised more than $100 million in its initial public offering in the spring, and its Class A common stock is now traded on the Nasdaq Global Select Market under the ticker symbol ROAD. "There is only so much money available to grow with private equity," Palmer said. "We believe raising public money is the best route to create shareholder value and continue to grow the company." Thus far the strategy has proved to be successful, as CPI reported $680 million in revenue in fiscal year 2018, which ended Sept. 30. The revenue was up from $568 million in fiscal year 2017, and the company target is $1 billion in revenue by 2022. When CPI started 18 years ago, Owens and Palmer were certainly not embarking on a road less traveled in their careers. In fact, combined, the two of them have more than 60 years of experience in the road construction industry. They both began their careers in the road construction industry with Couch Construction, a family-owned hot mix asphalt company in Dothan. In 1986, Couch was sold to Superfos, a Danish company. Superfos' United States division headquarters remained in Dothan, with Owens serving as president and CEO and Palmer serving as CFO. During their time at the helm of the U.S. division of Superfos, Owens and Palmer oversaw the acquisition and integration of more than three dozen companies. It propelled Superfos U.S. into one of the largest highway construction companies in the U.S. In 1999, Superfos U.S. was sold to Ashland Oil Co. In 2001, the newly formed CPI purchased its first platform company in Florida — C.W. Roberts Contracting. The Florida company remains an integral subsidiary of the CPI family today. A year later, the company expanded into the Alabama market by purchasing Wiregrass Construction Co. Wiregrass Construction, like C.W. Roberts Contracting, is still a subsidiary handling all types of Alabama road construction projects. In its first two years of existence, the young company was off and running by literally opening new roads for growth. CPI grew in Alabama and Florida during its first 10 years. The second decade has seen growth into Georgia, South Carolina and North Carolina. "Our target growth area is the Southeast," Palmer says. "However, if it made sense, we would look outside the Southeast." Palmer said Southeastern weather patterns allow for year-round project work. CPI's acquisition history has included five platform companies in Florida, Alabama, Georgia and North Carolina, 11 bolt-on companies and seven greenfield expansions. Bolt-on companies and greenfield expansions are operated through the platform companies. In addition, CPI operates 30 hot mix asphalt plants and nine aggregate facilities. The hot mix asphalt plants provide material to resurface roads, airport runways and commercial sites. CPI also sells asphalt from the hot mix plants to local customers in some of its markets. In fiscal year 2018, CPI produced 3.6 million tons of hot mix asphalt, which was up 12 percent over the prior year. About 70 percent of CPI's revenues come from public projects and includes local and state roads, interstate highways, airport runways and bridges. From a private perspective, CPI offers paving and site work services for residential subdivisions, office and industrial parks, shopping centers and local businesses. Both Owens and Palmer believe the company will continue to grow, because there is a significant need for road resurfacing and adding additional lane capacity. There is an increasing demand due to deteriorating roads and rising investment by public customers, such as states, in the fastest growing region of the country. "Our growth strategy is to continue buying existing family-owned companies," Owens said. "There are a lot of family-owned civil construction companies with hot mix asphalt plants." He also believes there are still a lot of families looking to retire and get out of the business, which will create more acquisition opportunities for CPI. CPI managers pride themselves on building a good reputation as a "buyer of choice" among companies looking to sell, allowing them to acquire and integrate some 16 companies over the years. "Our goal is to retain the local management team of companies we acquire and to keep day-to-day decision making at the local level, while standardizing key business practices and providing strategic leadership and insight from our senior management team," said Owens. "There are a lot of talented people who are experienced in this industry," Palmer said. "By acquiring family-owned businesses, we give talented people an opportunity to advance in the company." John Harper, president of Wiregrass Construction and senior vice president of CPI, is an example of someone who has advanced in the company. He was recently named chairman of the National Asphalt Pavement Association, which represents the interests of asphalt pavement material producers and paving contractors on the national level with Congress, government agencies, and other national trade and business organizations. As the company continues to grow, it is paving the way for talented individuals to keep CPI viable for years to come.